When you put this Multi TimeFrame Parabolic SAR indicator on the chart it will automatically use Parabolic SAR from next available 3 timeframes. 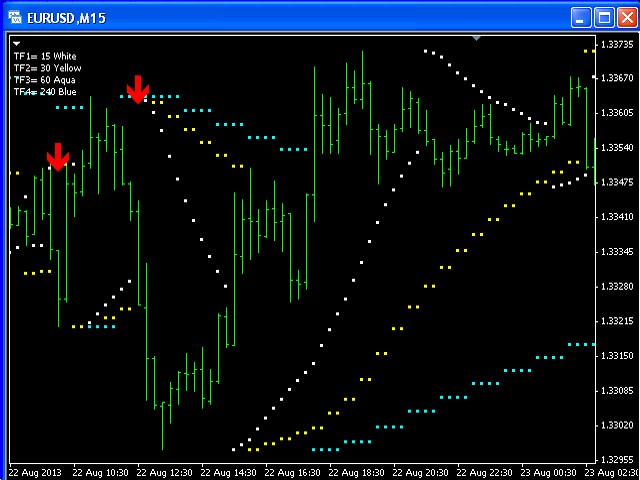 Green arrow will show the beginning of Up trend and Red arrow will show the beginning of Down trend. If eMailEnabled = true the Indicator will send you an eMail with the same text an Alert message with subject: "MTF-PSAR" (of course you have to check Email tab in the Options window).